Linguistics is the study of human language: its form, variety, and social life. Human language may be studied from a variety of perspectives, whether as a complex behavior, as a medium for creating and embodying social meaning, or as the instantiation of a highly structured system of knowledge within the mind of the speaker (a mental grammar), which can be investigated empirically and modeled formally. Starting from the detailed description of the structural patterns found in the world’s languages, linguists seek to establish general principles governing the organization, emergence, and use of language. Research in linguistics encompasses theories of how languages vary—and fail to vary—across space and time, how grammar evolved in the species and develops in the individual, and how language is used to create and reinforce social relationships. Phonetics—The study of speech sounds (or, in sign languages, gestures), their acoustic and physiological properties, and how they are classified and described. Phonology—How speech sounds/gestures are organized into systems, and how they interact with each other when combined to form larger units such as syllables, words, and phrases. Morphology—The internal structure of words, their categories and formal properties, and how they are related to other words in the speaker’s ‘mental lexicon’. Syntax—The rules or principles governing how words are combined to form phrases and sentences. Semantics—How words (and parts of words) are associated with meanings, and how the meanings of phrases and sentences are computed based on the meanings of their parts. Pragmatics—How speakers employ language to perform communicative tasks (making assertions, asking questions, issuing commands, etc.). Discourse—The linguistic study of ‘texts’ (stories, conversations, etc.) and of issues related to narrative structure, style, genre, etc. Theoretical/formal linguistics—The study of the structures and patterns that underlie the descriptive grammar of a language. Sociolinguistics—The study of language variation across different regions and social groups, and of how language use, and attitudes towards language users, are shaped by factors such as gender, ethnicity, class, religion, etc. Psycholinguistics—The study of human language from a psychological perspective, including how language is processed and stored in the brain, and how children acquire language. Anthropological linguistics—How language embodies or expresses cultural meaning; how using language creates and reinforces social relationships and identities. Historical linguistics—The study of how languages change over time. With its focus on language as a unique facet of human nature, linguistics bridges the divide between the cognitive sciences, social sciences, humanities, mathematics, logic, and philosophy. Linguistic concepts have also contributed to the understanding of style and rhetoric, genre and register, poetic meter, trope, and metaphor, thereby enhancing our appreciation of literature. The techniques of linguistic analysis provide a window into the ideas of other cultures, distant in space and time or close to home, and thus contribute to the study of history, anthropology, and sociology. Linguistic semantics has contributed to our understanding of the relationship of logic to language, and has influenced (and been influenced by) research in philosophy and mathematics. Finally, discoveries in linguistics have made major contributions to the development of cognitive science, and have applications in fields as diverse as neuroscience, evolutionary biology, and computer science and artificial intelligence research. "Why Major in Linguistics?" - information from the Linguistic Society of America. 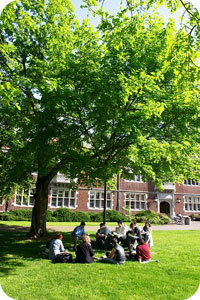 Reed offers a variety of linguistics and linguistics-related courses. In addition to introductory courses in linguistic analysis and in language and culture, more specific offerings deal with the core components of formal analysis (phonetics, phonology, morphology, syntax, and semantics) as well as sociolinguistic analysis, alongside several advanced courses building on these areas. Courses are also offered periodically on the structure of less familiar language families (e.g. Austronesian) and regions (e.g. South Asia). Linguistics at Reed has an interdisciplinary orientation: through the allied field and language requirements, students are encouraged to develop links to other fields, including English, anthropology, sociology, philosophy, mathematics, psychology, biology, and classical and modern languages and literatures. Students may also have the opportunity to engage in linguistic fieldwork, locally and abroad. The Lab of Linguistics (LoL) is located in Eliot 101D. This lab space houses a sound-attenuated recording booth, articulatory data collection equipment, and several types of audio equipment including microphones, digital recorders, speakers, and headphones available for checkout to current Linguistics students. Work as a Research Assistant @ Reed!